Phobias typically develop in childhood around age 7, but they can emerge at any time, experts say. (CNN) -- In mid-interview for a new movie last week, actress Salma Hayek suddenly shrieked and scrambled out of her seat, over the shoulders of co-star Maya Rudolph sitting next to her. Clutching frantically at Rudolph and another co-star, Maria Bello, she uttered a blood-curdling scream, "Somebody do something!" Bello, also clearly unnerved at the sight of something off-camera, comforted Hayek as she teetered on the arm of a director's chair in 4-inch heels. "It's OK," Bello repeated, "We got you. Don't worry." What prompted the visceral panic? A snake. More than 19 million American adults have a specific phobia, a powerful, irrational fear of a particular scenario or object, according to the National Institute of Mental Health. Usually the fear develops in childhood; the median age is 7 years. This is distinct from agoraphobia, a fear of situations where it may be difficult to escape, such as in cars, planes or crowded areas. About 1.8 million American adults have agoraphobia, which typically develops around age 20. There is also social phobia, an anxiety disorder that may include speaking in front of other people, which affects 15 million American adults. As with other mental conditions, experts believe phobias arise from a mixture of environmental and genetic factors, but there is no specific formula to determine who will have one and who won't. There are dozens of names for specific phobias -- ophidiophobia is fear of snakes, aranchnophobia is fear of spiders -- but anyone can become afraid of anything, said John Tsilimparis, founder of the Anxiety and Panic Disorder Center of Los Angeles, California. Upon encountering a source of fear, the brain gets alerted that what it is seeing is not what it expected, said Reid Wilson, director of anxieties.com and the Anxiety Disorders Treatment Center in Chapel Hill, North Carolina. This sets off a response of arousal and fear; the brain area called the amygdala plays a role in the "flight or fight" response. The mind becomes alert to possible instances of that same source of threat, he said. "Every stick looks like a snake, every rustling in the leaves, every garden hose," he said. To some extent this reaction has been passed down evolutionarily, experts say. Human ancestors in the wild needed to be cautious about predators or poisonous creatures, so fearing them helped their survival. Normally, after a while, a person would begin to reason that the snake's appearance was a rare event, and particular to that situation. Not so with phobias. "People with phobias don't get to experience it like that. They don't unlearn it. They just stay afraid," he said. Phobias are very treatable, but most people with phobias never get help, Wilson said. Treatment involves getting exposure, in a controlled setting, to what you are afraid of, starting from the smallest step. For instance, a person afraid of spiders would start with a tiny square with a black-and-white drawing of a spider, and work his way up to touching that drawing, Wilson said. 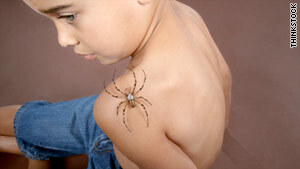 Color photographs, videos and live spiders also figure into getting rid of a fear of spiders. Faryl Zaklin, 38, of San Diego, California, is still overcoming a lifelong phobia that has given her numerous panic attacks; part of her recovery involved watching episodes of "Jackass" and "Family Guy." She has emetophobia: fear of vomit. Since childhood, Zaklin has gone out of her way to avoid people at amusement parks, concerts and on airplanes who might be on the verge of throwing up. She was always assessing her surroundings, scanning the scene for potential vomiters, and would "leap" out of the way if she detected a risk of someone throwing up. "It's panic, it's almost painful," she said. "I don't know anything else that's ever given me that much fear." She decided to get help last fall, and is still getting counseling for her phobia. Her therapy started with just getting adjusted to viewing the word "vomit," starting with one letter and then filling out the rest. She also used an iPhone application that makes vomit sounds to get used to that aspect of throwing up. Zaklin feels like she has made progress. Today, she views situations that may involve vomit with a "nervous curiosity" rather than sharp fear. "I'm scared of it scaring me, and so if I know it's not going to scare me and I can tell myself that, then there's no reason for me to be afraid of the potential fear it might cause," she said. Zacklin has also undergone treatment for obsessive compulsive disorder, but psychologists note that this is not the same as a phobia. People with OCD engage in repetitive behaviors to go along with their obsessions; for example, washing hands dozens of times to avoid germs.